Disposable paper Doilies and Cake Laces are effective for creating an elegant display of food products and tabletop settings. Bakeries and delis use them for their displays while restaurants and hotels use them for fancy table settings. Our doilies from Hoffmaster are the best restaurant supply doilies from a name you can trust. Hoffmaster Cambridge Lace Doily - 4 in. Hoffmaster Cambridge Lace Doily - 5 in. 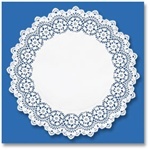 Hoffmaster Cambridge Lace Doily - 6 in. Hoffmaster Cambridge Lace Doily - 10 in. Hoffmaster Cambridge Lace Doily - 12 in. Hoffmaster Kenmore Round Cake Lace - 18 in. Smith Lee French Lace Doily - 5 in. Smith Lee French Lace Doily - 6 in. Smith Lee French Lace Doily - 8 in. Doily Normandy Lace - 5 in. Doilie Normandy Lace - 8 in. Doilie Normandy Lace - 10 in. Doilie Normandy Lace - 12 in. Doilie Normandy Lace - 6 in. Normandy Lace Doily - 5 in. Normandy Lace Doily - 10 in. Normandy Lace Doily - 6 in. Normandy Lace Doily - 8 in. Round French Lace Doily Paper White - 4 in. Round French Lace Doily Paper White - 5 in. French Lace Doily Paper White Round - 12 in. Round French Lace Paper White Doilies - 10 in. French Lace Paper White Doilies Round - 6 in. The doily was first developed in 17th century England. This decorative piece of fabric is traditionally used to both protect the surface of the table underneath and provide a decorative surface for the object placed on top. Doilies can be used to create a stunning tablescape. The intricate appearance of this accessory instantly transforms the setting from everyday to special. Though traditional doilies are made from thread, similar products today can be fashioned from paper. Paper doilies and cake laces are an excellent solution for a special setting when you want the space to look nice without spending a fortune. The traditional decorative doily has a rectangular or round shape, making this accessory the ideal accompaniment to a beautiful cake. If you don't have a special platter or stand to present your baked goods on, paper doilies and cake laces will instantly dress up even a standard countertop. In a bakery setting, an arrangement of paper doilies beneath your cakes will transform your display case from an ordinary and bland space to an elegant display of exquisite desserts. There are so many different sizes and designs available to you that creating a professional-looking display is easy. Combine several styles of cake lace for a display worthy of a professional decorator. Doilies and Cake Laces are an extra cost for table settings but give you a million dollar look.